Room purpose and size: A kitchen and dining room with French doors to a courtyard. The area is 32 square metres in total. The clients were looking for a relaxed setting to reflect their love of fine art, cooking and reading, extended family entertaining and events. They wanted something informal with a hint of country, but with quite a sophisticated and beautiful material palette. The budget didn’t permit a radical transformation to the rear facade, yet we had to improve the indoor-outdoor flow. We began by prioritising the large island bench. Freeing it of services meant it could provide a generous preparation area and become the centrepiece for relaxed social interaction, with leisurely cooking prep and glasses of wine over a long lunch or dinner. We also had to accommodate a freestanding Lacanche cast-iron range, which provides a hint of country charm and complements the French doors. The stone is the feature element and the hero of the kitchen. The remaining materials were selected to respond to the ‘hint of country’ in the brief, with a contemporary feel. We introduced a third set of French doors to improve the indoor-outdoor flow and balance the facade. Together they work to provide the look the clients wanted. Colour palette: A custom deep- blue based on ‘Blue Lobelia’ from Dulux was the only colour applied. The balance of colour comes from the remaining natural materials themselves. 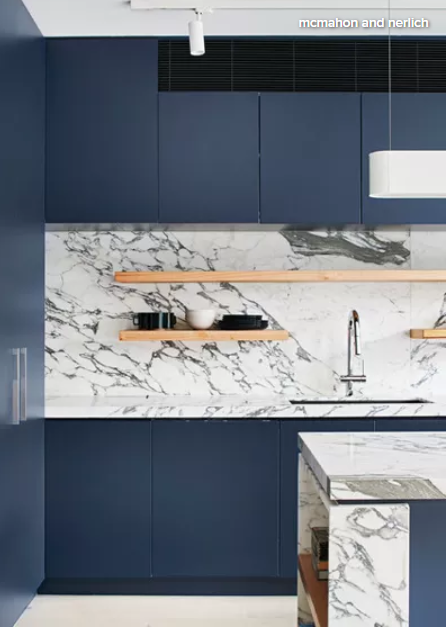 Materials palette: Arabescato Vagli stone features on benchtops and splashbacks and is complemented by the warmth of the Victorian ash shelves and the deep-blue cabinets. The engineered-timber floor was selected for a touch of country style. The Arne Jacobsen for Louis Poulsen AJ Royal pendant light above the dining table is from Cult. The feature kitchen pendant and spotlights are from Darkon. The timber table is by Mark Tuckey, while the dining chairs are from Danish Red in Armadale. The black steel planter boxes are from Redfox & Wilcox. Thinking behind the arrangement of furniture/fixtures: Everything is organised around the generous island bench, the kitchen is complemented by the adjacent timber dining table to provide a place for the family to eat, read, study, relax and converse. Open timber shelves increase the practicality of the high overhead cupboards and allow for display of glassware and objet d’art. A significant part of the brief was to house the clients’ enormous book collection. 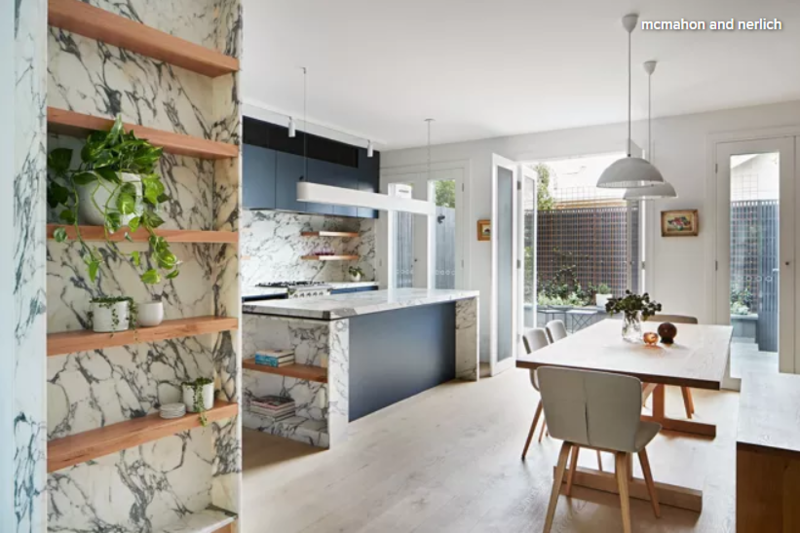 The dining room wall is fully lined with the cantilevered timber shelves, which work with the Mark Tuckey timber table. 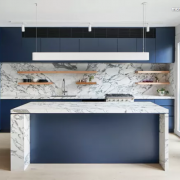 The marble is also used as shelving, with the cabinets dividing the kitchen and living room fashioned into a full-height bookshelf, and a hybrid marble-timber bookshelf in the end of the kitchen island itself. Vertical elements such as the integrated refrigerator and pantry are located together opposite the French doors, and appliances and sink arranged along a long bench to the rear. A frameless, flush range hood is perfectly concealed behind the overheads. The pantry doors open to reveal hidden additional bench space, complete with sensor lights and marble. Deep overhead cupboards imply a continuous surface, elegantly resolve the junction with the pantry, and create a recessed appliance area. The clients wished to negotiate with a particular builder, which caused some challenges with budgets at a late stage, however, everyone pushed through these issues in good faith to obtain a great outcome. Why do you think this room works? We love this room because it is a deep response to the personalities of the clients and their design commission. 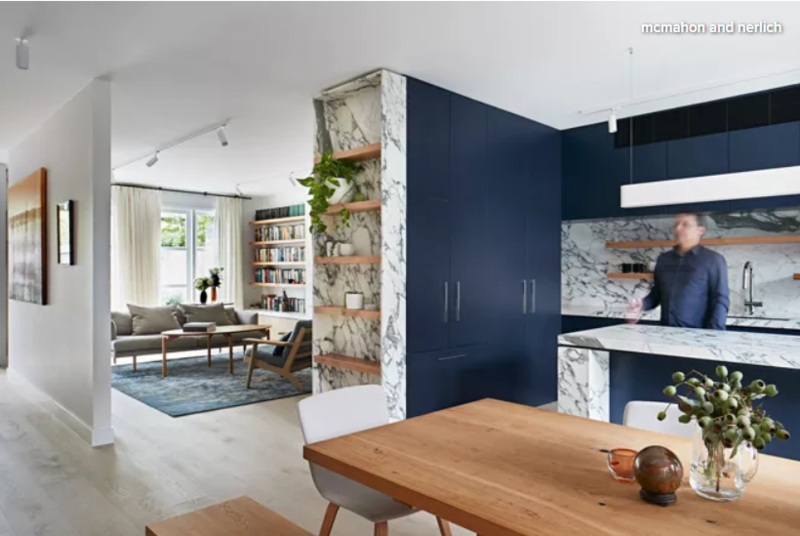 For a semi-retired couple in a conservative suburb of Melbourne, most designers and clients would err on the side of restraint. Yet our clients had a real appreciation for art and literature and immediately responded to the artistic provocation of this incredible Arabescato Vagli marble, as well as the resonance of the deep blue. We presented it to them and they loved it. The design is contemporary in nature, but with all the timber and marble elements balanced, the centrepiece of the island bench and the introduction of the triple French doors, it still references a hint of country with a relaxed and informal setting. Want to shop this look? 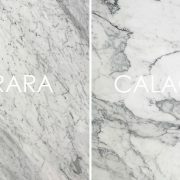 Check out Arasbecato Corchia and Arasbecato Don from our Carrara Marble range. 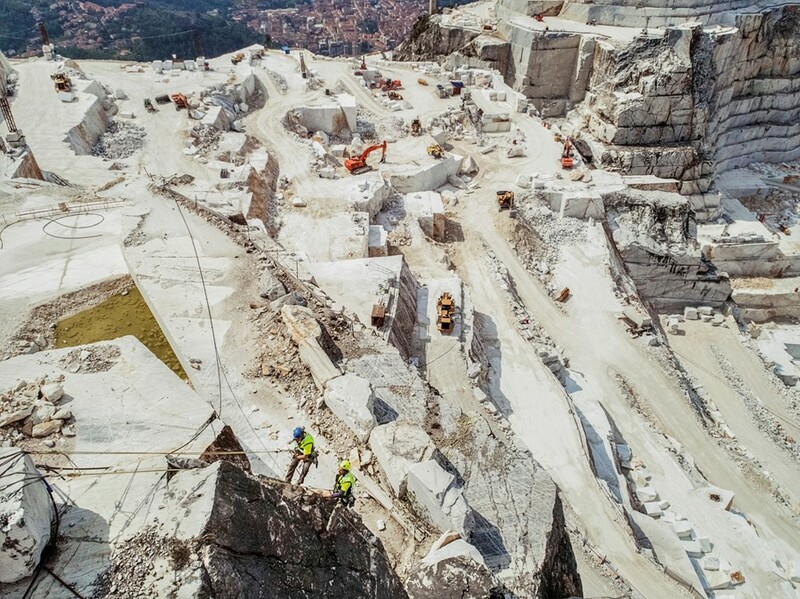 Photographer Luca Locatelli goes literally above and beyond to take these stunning photographs of Northern Italy’s marble quarries. Capturing these ancient pieces of large, white stone, being quarried and processed into what will become an ever-so-desirable marble kitchen benchtop. 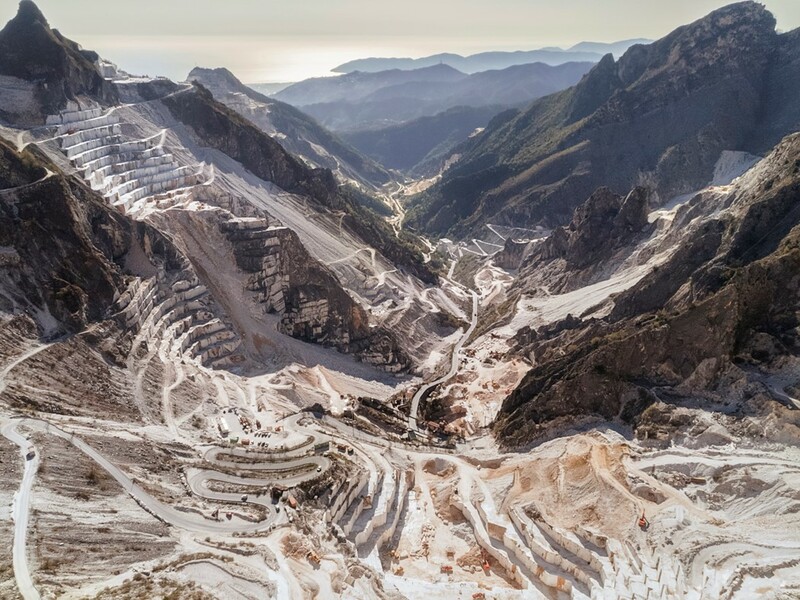 He’s well known for his awe-inspiring photographs revealing how humans and technology are altering the world we live in, so it should come as no surprise that Luca Locatelli’s body of work about Northern Italy’s majestic marble quarries delivers a devastating blow – in the best possible way. 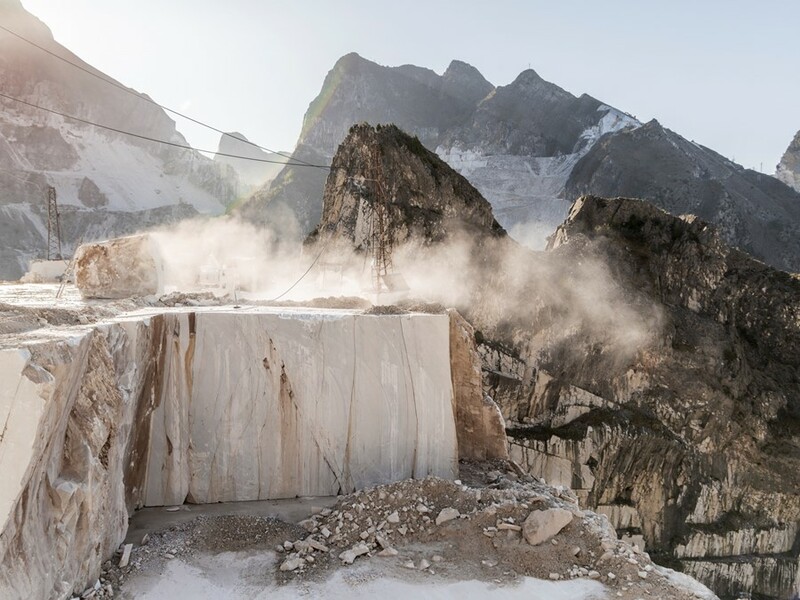 Locatelli was recently shortlisted for an award in this year’s Sony World Photography Awards for White Gold, published by The New York Times Magazine, which series turns the spotlight on the Italian marble trade. 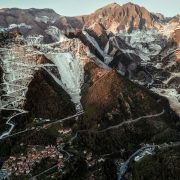 The Italian photographer has been training his lens on the stunning Apuan Alps. An area rich in marble. The naturally occurring and extremely desirable stone made from tiny crystallised creatures compressed over hundreds of millions of years. 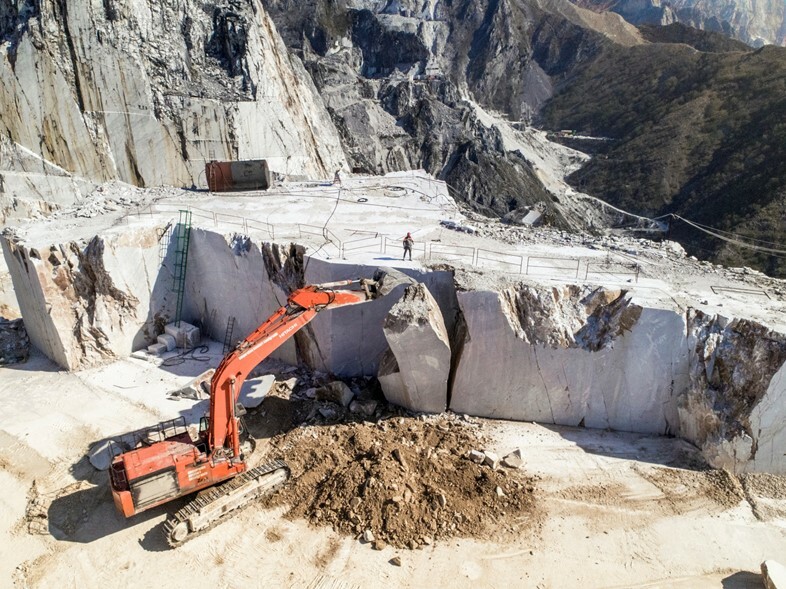 Since Roman times, humankind has ripped the dazzling white stone from the land via hundreds of quarries that operate in the region. Activity in this part of Italy is as intense as ever. Outside of the country, current demand mainly comes from cities from Abu Dhabi and Mumbai to Beijing. With the marble destined for mosques, malls and hotel lobbies as well as lavish palaces. To say it is big business is an understatement. 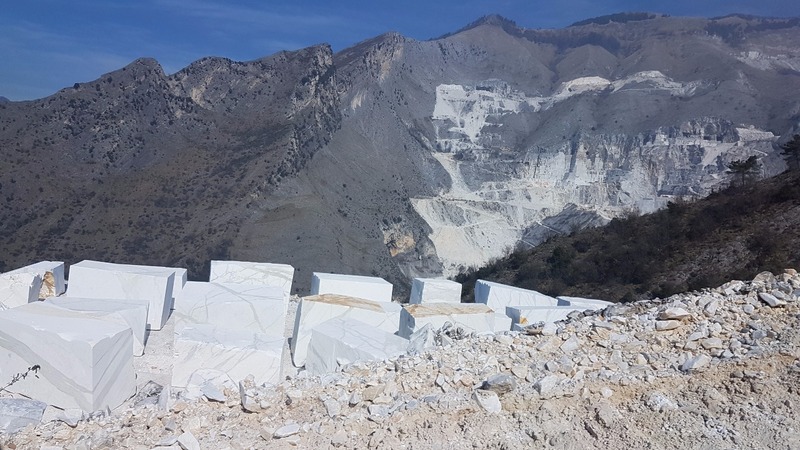 Quarries such as Henraux Cervaiole, the Calacata Borghini and the Borghini, all of which Locatelli photographed, are working flat-out to keep up with demand. 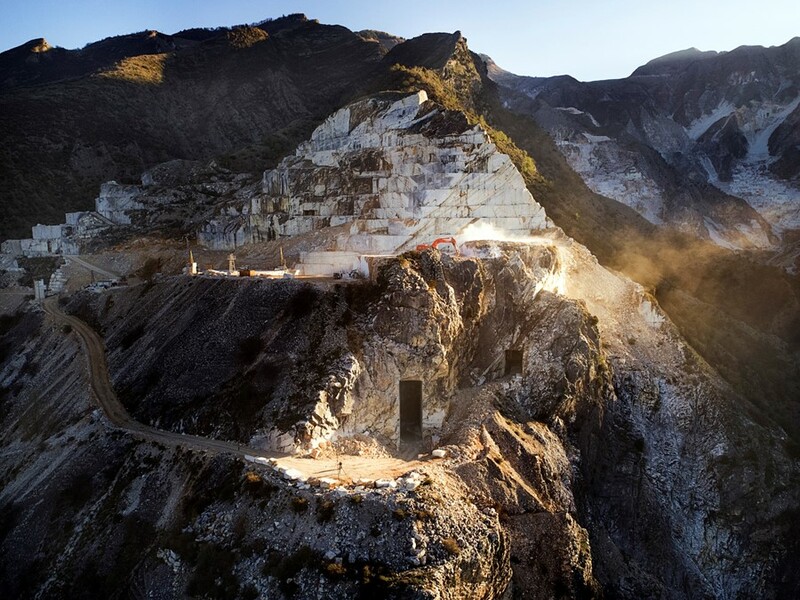 As Locatelli’s images so powerfully show, the quarries are staggering in terms of size and shape. Their sheer scale is not always immediately obvious. Look once and you’ll see the jagged side of a mountain. But look again and you realise there are tiny tractors and men crawling all over. 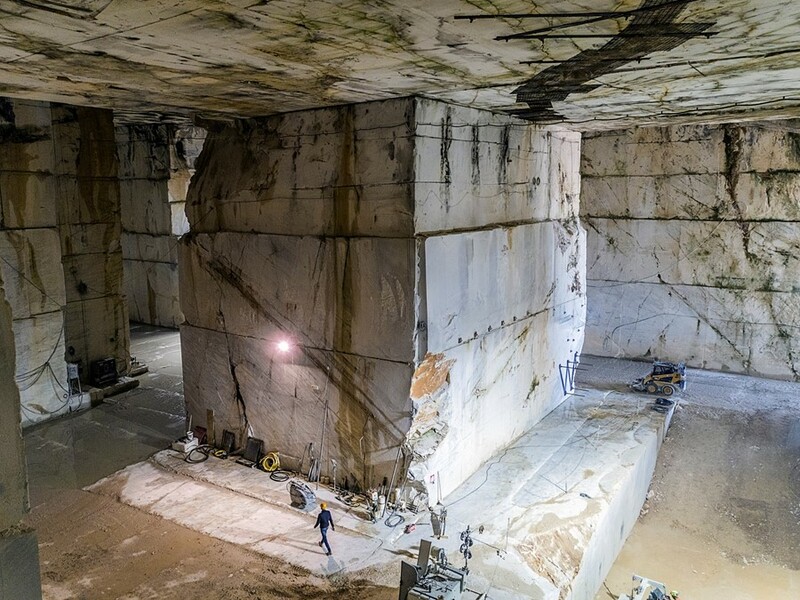 Using a drone to capture many of the most breathtaking views from above, Locatelli also went inside the quarries, boarded a cargo ship that transports the marble, and visited a workshop where sculptors are pictured honing their craft. 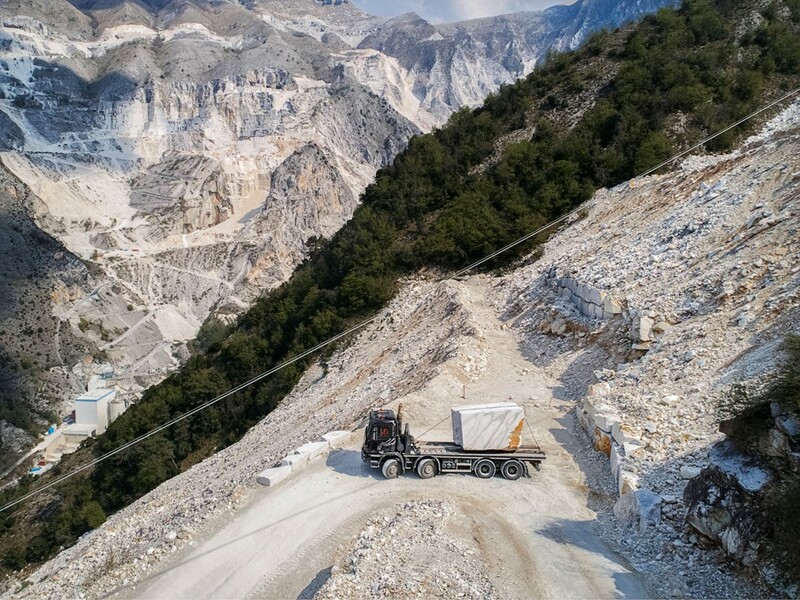 “The marble quarries of northern Italy are famous around the world. They are so impressive.” says Locatelli, who is based in Milan. Shortly afterwards, The New York Times Magazine contacted him suggesting they work together on a project. 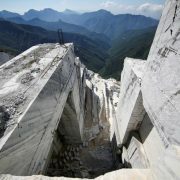 Want to use marble outdoors, but worried how marble withstands storm and other weather conditions? Yahoo.com reports on two ancient pillars sadly being destroyed by the storm just days ago. Meanwhile, four white marble minarets surrounding the Taj Mahal survived the violent winds. Yet again standing against the test of time. Agra (India) (AFP). 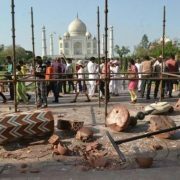 A violent storm has destroyed two ancient pillars at the entryways to the Taj Mahal, an official said Thursday. Underscoring the fragility of the centuries-old marble monument to love. The four-metre high sandstone minarets topped by ornate spires were left in chunks after being felled by strong winds late Wednesday. “Two decorative pillars collapsed last night amid high-velocity winds. One of the pillars stood at the royal gate. The other at the southern gate.” an official from the Archaeological Survey of India told AFP. None of the four white marble minarets surrounding the Taj — or the spectacular shimmering mausoleum itself — were damaged in the storm, authorities said. Tourists often get their first glimpse of the Taj — a UNESCO world heritage site — through the royal gate, a grand fortress-like entrance made largely of red sandstone. It was flanked by two imposing minarets before the storm brought one crashing down. Footage showed the stone pillars lying in large broken pieces. The distinct spire is still intact but separated cleanly from the shaft. Nobody was injured by the falling steeples, authorities said. Mughal emperor Shah Jahan built the Taj Mahal as a tomb for his beloved wife Mumtaz Mahal, who died giving birth in 1631. The Taj is one of the world’s most popular tourist attractions. Beset by problems from air pollution yellowing the marble to insects leaving green stains on its rear wall. Efforts to restore its grandeur have dragged into a fourth year, with scaffolding marring the view for the 10,000-plus tourists that visit the 17th-century mausoleum every day. Work is yet to begin on its main dome, with authorities concerned about how to proceed with handling the fragile centrepiece. VSG is Rained Out Today! But What About Our Outdoor Stone? Natural Stone At Home? How Much Is It Worth? In 1990, a Brooklynite was at a New Jersey construction salvage yard examining a pile of marble slabs for a table top. 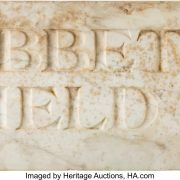 After a short bidding war, he obtained a 21-pound slab of Italian natural stone for a very modest sum and lugged it home where it resided for the next 25 years. The owner knew it had something to do with the Brooklyn Dodgers’ fable ballpark from 1913 to 1957. The holy relic, from Ebbets Field’s ticket rotunda, recently sold for $72,000 in a Heritage auction. Shipping was only $45 due to Fed Ex’s great rates. “It stands as the most significant artefact from the storied Brooklyn landmark in private hands. Second only to the original cornerstone at the permanent collection of the Baseball Hall of Fame,” Heritage noted. Browse through the Victoria Stone Gallery collection to find the perfect stone for your project at a great price. Natural stone truly can add to the value of your home more times than not. Stay on top of trends and choose wisely! 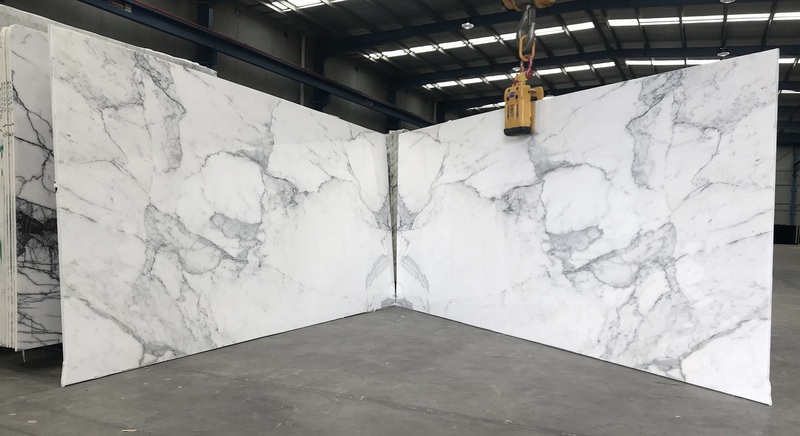 https://victoriastonegallery.com.au/cms/wp-content/uploads/2017/10/Ebbets-Field-Marble-Slab.jpg 1274 3000 sophie Van der Linden https://victoriastonegallery.com.au/cms/wp-content/uploads/2017/05/icon-white.png sophie Van der Linden2017-10-23 14:23:462017-12-05 16:47:17Natural Stone At Home? How Much Is It Worth?